EASTER QUIZ. What do you know about Easter? Pronto van a comenzar las fiestas de Semana Santa, y queremos dejaros este Easter Quiz, un pequeño pasatiempo para que además de no oxidados con el inglés., podáis conocer un poco más de cómo se celebran estas fiestas a lo largo del planeta. Para participar, debes enviar responder a estas preguntas en la correspondiente entrada de nuestra fan page de Facebook o de Instagram. Entre los acertantes de todas las respuestas sortearemos una Easter basket. Las respuestas las publicaremos el próximo 16 de abril, y el sorteo lo realizaremos el lunes 17 de abril. ¡Suerte a todos y Felices Fiestas! 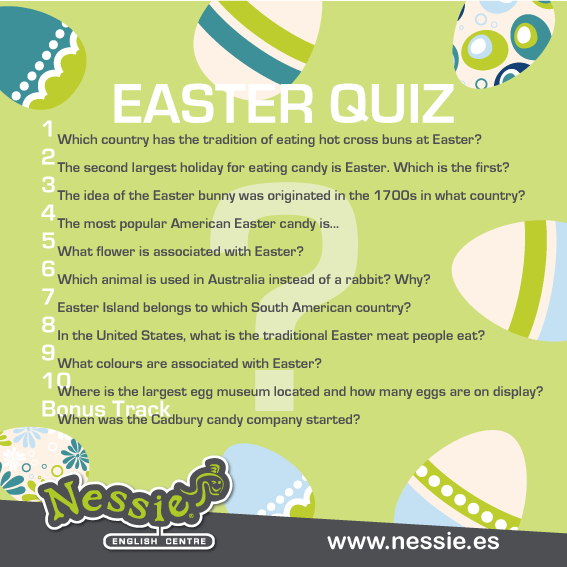 The idea of the Easter bunny was originated in the 1700s in what country? What flower is associated with Easter? Which animal is used in Australia instead of a rabbit? Why? Easter Island belongs to which South American country? In the United States, what is the traditional Easter meat people eat? What colours are associated with Easter? Where is the largest egg museum located and how many eggs are on display? BONUS TRACK. When was the Cadbury candy company started?